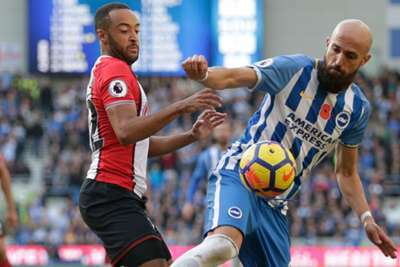 Brighton and Hove Albion will host Southampton in the EFL Cup second round's only all-Premier League tie, while Leicester City will meet Jamie Vardy's old club Fleetwood Town. Thirteen of the 20 English top-flight clubs enter the competition at this stage, with the other seven not starting their campaigns until the third round due to being in Europe, and Brighton's clash with Southampton is the only fixture that features two Premier League sides. Leicester have been drawn at home to Fleetwood - for whom England international Vardy played for prior to joining the Foxes - Everton will entertain Rotherham United, West Ham will travel to AFC Wimbledon and Newcastle United will visit Nottingham Forest. Championship clubs Stoke City, Reading and Swansea City will all fancy their chances of achieving upsets having been drawn at home to Huddersfield Town, Watford and Crystal Palace respectively.